I really liked this concept, but got tired of how they were playing it out halfway through season 1. I finished season 1, but stopped there. I know within the genre, it's pretty standard, but I just could get into the style and portrayal of this story. I think if I watched this as a kid, I would've enjoyed it a lot more, so maybe I just can't get past the showmen aspect with this show for some reason...Also, personally, the animation style isn't my thing. When I started this anime, it was about 2 years ago, I binge watched many of the episodes until I just started getting bored. I ended up dropping it in my "queue" and forgetting about it. Looking back at some anime that I never finished, i decided to give it a chance again because I remember I enjoyed it enough to binge watch it and start puzzles myself. I finished the rest within a couple days. I think the anime is really fulfilling as it does tie up a lot of loose ends in the ending, It had me on a rollercoaster and thinking "there's no way ____ could happen/be true." I would recommend watching it! If you like puzzles then this show isn't for you. I knew I should have stopped watching when I saw the main character solve a medium level Sudoku puzzle in the first episode, and everyone around him was astonished. Watching someone solve a puzzle isn't exciting, but the fun comes from the puzzle keeping the solver engaged. I was hoping for more, but I got what I expected. They cut out the solving completely. Shows the puzzle..... BAM! answered. PHI-BRAIN as entertaining as the back of textbook. I think It's a good show for kids maybe, that's why I left it at 2 stars. Otherwise, it's a one star. Personally, I haven't watched the 3rd season yet so please don't judge me on that. But judging from the first 2 seasons, I feel like it's a bit too repetitive, yet entertaining enough to keep watching. The plot follows as the main character of the series solving deadly puzzles with an ancient artifact messing or helping him out. I mean, I really did enjoy the show itself. Some characters and episodes were more memorable than others. Whether you liked the characters or not it's completely up to the watcher, but the characters aren't too bad. At least not bad enough you quit the series. It's a good show, but don't expect a masterpiece. There are flaws, but the concept is interesting. Characters and plot is fine, but isn't executed to it's full potential. Thus, watch it if you're bored. Anime and puzzles, two of my favorite things put in one. I love this series so much, and I'm very glad I got to take the time and watch it (just before I go back to school!) because Phi-Brain gave me almost everything I wanted in an anime. The characters were fantastic, and the story was able to match, all to my surprise. The development of this story was far better than I had ever imagined it to be. The ending was by far my favorite part. Here's to hoping for a season 4! Are you a Phi Brain? This series was definitely interesting but I admit that season 2 is where you might lose people as far as interest goes. 1st and 3rd Season are definitely the best and the characters are enjoyable (you're bound to have at least a couple of favorites that you like). The plot was excellent; the only thing is that you really have to get all the way to the middle of the 3rd season for things to start adding up and for wrapping up loose ends. Still, I give this series a 4 out of 5 because I never knew you could make a a pretty good anime out of puzzles. There are some elements of the show that suffer from repetition and the lack of the "death" element when these are some really deadly puzzles they face seems to stretch plot armor too far (even for supporting characters). All in all, I enjoyed it and I recommend giving it a try. If the 1st season doesn't grab your attention then you probably should stop watching all together or (at the least skip the second season, and read some character bios so you won't be lost, 3rd season has a slow start though) because the 2nd season is more of a carryover season and so if you don't like the 1st season that much then the 2nd season will probably run you away. 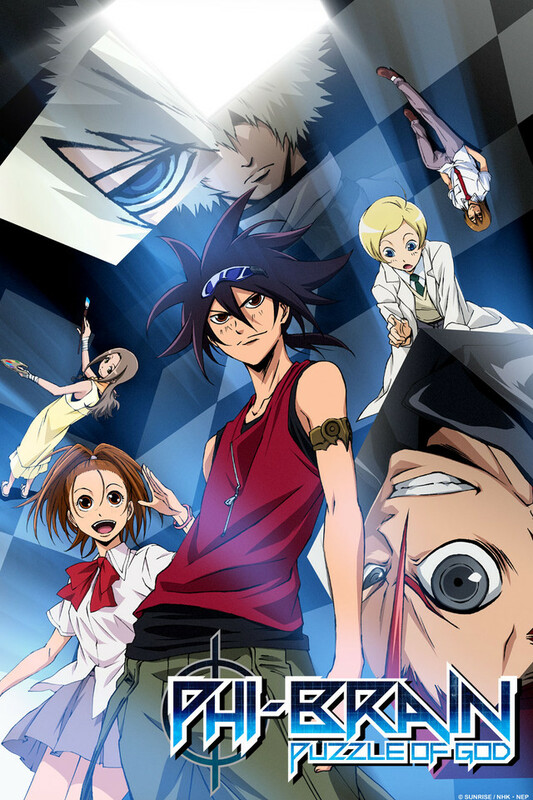 Still, How many other anime series are about puzzles ... Will you watch til the end and become a Phi-Brain??? The story - the characters are ok, but their motivations are not clear or made up on the spot or just illogical... like most of the stories involve some weird possessive friendship angles or fake memories. Actually it makes no sense a lot of how the characters are tied to the story. Puzzles - The puzzles, well some of them are really interesting and enjoyable... but the majority are like... imagine watching someone play checkers or chess, do a maze or like Tetris against another player.... I wish they gave the viewer some chance of actually solving something also... instead you are waiting for character to be like "Oh. There is that block over there I did not stand on. Why is it there?" Additionally a lot of the puzzles involve them breaking the rules like jumping over walls or breaking walls. I watched the whole thing but I would not watch it again. I did like some episodes though. I might watch new episodes. I think I was prepared for this to not be good, just from the title. But was surprised to find it extremely interesting. It makes you think about the world a little different. And the characters are different. I guess I have watched so many animes that I find a lot of them the same. This has to be the only one I ever seen about puzzles. Way to go. Good start and bad finish. This anime was really interesting in the early episodes. Solving dangerous puzzles to earn prizes and eventually solve the puzzle of god. The story was captivating and the characters were pretty good from the start. Then everything became kind of ridiculous. The bad guys in an effort to stop the solvers use puzzles instead of physically stopping the person with force. It all went in a totally different direction and lost track of where it was heading initially. I watched every season until about halfway through the 3rd one. It's ok for something to watch if you have nothing else, but there are a lot of better animes out there.